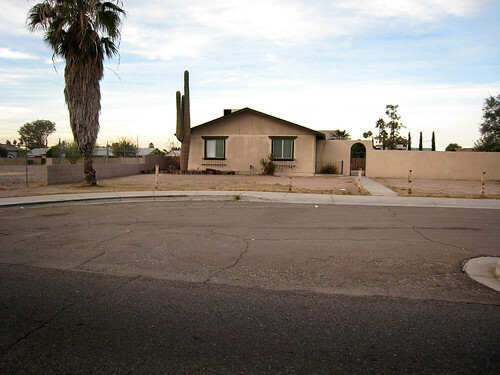 suburban desert dwelling, originally uploaded by mannydiller. Manny Diller’s series of suburban Phoenix photos needs to be a book. Well the big plus is the owner isn’t wasting a lot of valuable water on a lawn! I was just thinking, wow, that looks like Phoenix, when I read the caption! I have friends there, so I visit occasionally, but the summers there are frankly downright frightening. The place isn’t really human habitable. I LOVE suburban home photography. Not bleak enough. Needs bars on the windows. The kind that don’t open from the inside. I am wondering if those posts are the metal kind. I could see some kids making a habit using this front yard as an alternate path through the neighborhood. I’m not speaking from experience or anything. On another point, having lived in VegASS when I when I was 10, the scary part about a yard like this is that you actually have to weed it on a regular basis to retain it’s pristine dismal state.